After a fair few cancellations of this lesson, the weather conditions were finally good enough for me to get back up in the sky. During the pre-flight briefing, I was told we would be practicing climbing (and conveniently) descending. In the syllabus, climbing is exercise 7 and is in two parts (with exercise 8 being a two part descending exercise). However, it makes more sense to do climbing and descending part one as one lesson, then climbing and descending part two next lesson. Direction – are we heading in the right direction? Attitude – are we still in the climb attitude, and is our airspeed correct? Balance – are we in balance? Correct with the rudder if we’re not. Engine – are the temperatures and pressures within limits? The reason we don’t PAT when exiting a climb is because of the difference in airspeed. As we saw in an earlier lesson, the engine RPM is linked to airspeed. So, if we set 2350 RPM at 80kts and changed to a level attitude, airspeed would increase to the cruise speed of 100kts and then we’d notice the RPM was higher than 2350 and we’d need to repeat the process all over again. So, instead, when exiting a climb, APT. As with climbing, during the descent we should DABLE every 500 ft. 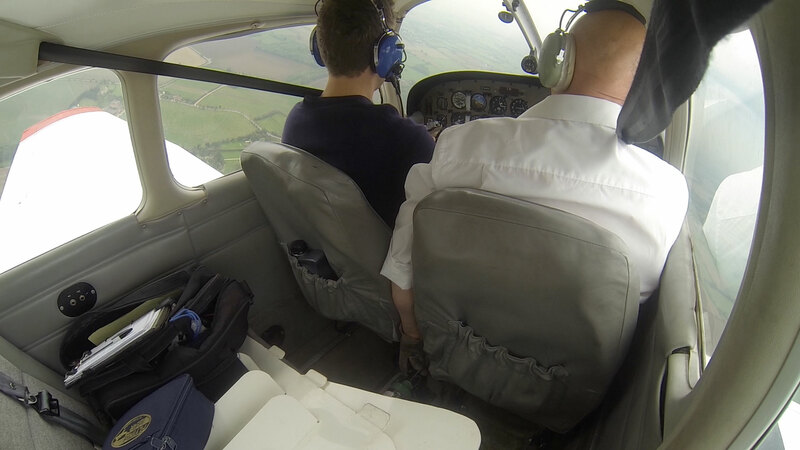 Exiting the descent is a standard PAT, remembering to turn carb heat back to cold before putting on full throttle. More on carb heat in another blog post. All in all, I found this lesson relatively straightforward and it sure felt good to be back in the air after those few weeks being grounded by the weather. The glide descent resulted in an altitude loss of around 500ft per minute, which felt surprisingly slow. Very reassuring that we’d actually have quite a lot of time to prepare for an emergency landing if the need ever arises (assuming we’re at a sensible height). To view it full-quality, you need to select HD from the settings menu and then click full-screen. One annoying thing about the GoPro was the battery life. It recorded 1 hour and 7 minutes before running out of juice. Not enough to capture the landing. Next lesson – in a week’s time – will be climbing and descending part two. Climb is Power, Attitude, Trim. Descend is Attitude, Power, Trim. The golden rule, is always airspeed. Never get close to the stall unintentionally. Power *before* you set attitude to climb maintains airspeed, attitude before power reduction when levelling off maintains airspeed. Great blog. Believe slight error in second paragraph – Vy is *rate* of climb. Angle is Vx. You’re quite right – well spotted! I’ve corrected it now. Cheers. I learnt at glos in a very unique aircraft – now converting to pa 28 and your blog is a great resource (whilst not replacing tuition and poh study of course…).